Many people think that individual chocolate souffles are the perfect dessert. We don’t disagree. 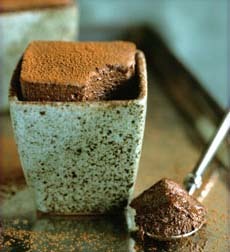 The large amount of cocoa powder in this recipe is responsible for the richness of the soufflés. And as if that isn’t enough, 70% chocolate is folded into the batter. When Michael made his recipe in his pastry-chef days, he stood the chocolate batons normally used for pain au chocolat in the soufflés just before baking them. This recipe uses grated chocolate instead. You can prepare the molds and make the chocolate base up to 6 hours ahead; reheat the base over simmering water before folding in the egg whites. Coat the bottoms and sides of eight 5-ounce individual soufflé molds with the butter. Mix the sugar and chocolate together in a bowl. Divide the mixture evenly among the molds, and then tilt and rotate the molds to coat the bottoms and sides fully and evenly. Refrigerate the molds while you prepare the soufflé base. Preheat the oven to 350°F. Sift the cocoa powder into a bowl. Put the water in a medium saucepan. Scrape the vanilla seeds from the beans into the pan and then add the beans. Bring the water to a boil over medium heat and remove from the heat. Cover the pan with plastic wrap and let steep for 5 minutes. Take out the beans and bring the water back to a simmer over medium heat. Whisk about half of the cocoa powder into the water. After it is absorbed, whisk in the rest of the cocoa powder. Place over medium heat and cook, whisking constantly, until the base is the consistency of mayonnaise, 4 to 5 minutes. Remove from the heat. Put the egg whites and salt in the bowl of a stand mixer fitted with the whip attachment. Beat on medium speed until they start to froth and then add about one-third of the sugar. When the whites are opaque and start to increase in volume, add another one-third of the sugar. When they start to become stiff, increase the speed to high and add the rest of the sugar. Beat until the whites start to lose their shine but still look wet. They will hand in medium-stiff peaks when the whip is lifted from the bowl. Transfer the cocoa base to a large bowl. Fold about one-third of the whites into the base with a rubber spatula. Fold in the rest of the whites just until no white streaks remain. Fold in the 3 ounces of grated chocolate after all the egg whites have been folded in. Distribute the mixture evenly among the prepared molds, filling them level with the top. Put the molds on a sheet pan. Bake on the middle shelf of the oven until the soufflés rise about 1 inch above the rim of the molds and have a crust on top, about 20 minutes. They will be wobbly. Transfer them to serving plates and take them to the table immediately. Just before serving, pierce the cap of each soufflé and spoon a tablespoon of Vanilla Bean Ice Cream in the center. For more desserts, read Chocolate Obsession: Confections and Treats to Create and Savor, by Michael Recchiuti and Fran Gage.